I've tried to get into the universe of EVE Online countless times over the years, but I've never managed to form a lasting relationship with the game. 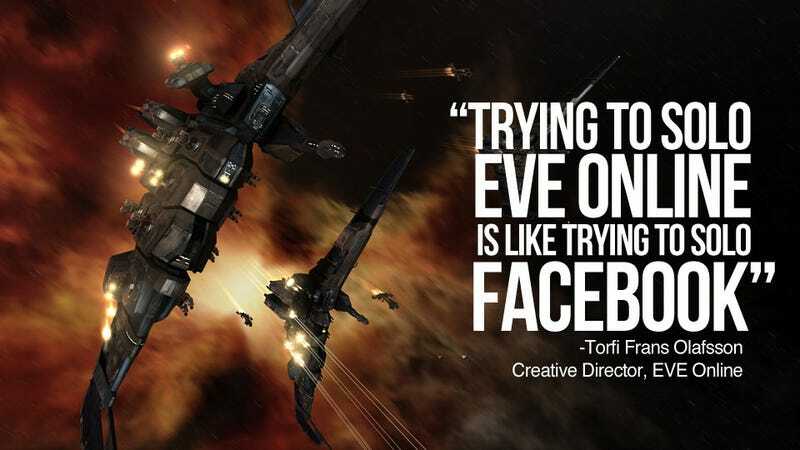 During my E3 meeting with CCP, EVE Online creative director Torfi Frans Olafsson explained why with a single sentence. EVE Online is a game driven by the players, those people that outsiders like myself only hear about when something goes wrong, be it bamboozling other players out of large amounts of in-game money or rising up against the developers when new features don't meet their approval. I've spent my time in EVE Online familiarizing myself with the mechanics, accruing skill points and building my personal wealth. I've been playing a game; I just haven't been playing the game. The game in which you get to know the people in your universe. The game where you wander into a sector, see some people you know, and maybe you live, maybe you die, but you have a damn good time interacting with whomever you meet. I've been playing alone, and yeah, it's sort of like trying to play Facebook by yourself. You see notifications going by, get the feeling that something much larger than you is going on, but until you take the plunge and add a few friends to your list, you're not getting the full experience. Perhaps it's time I fix that. The next time I log into EVE Online (and it will be soon), I'm going to make some noise and see what kind of action I can stir up. Maybe I'll live, maybe I'll die, but I've got a feeling it'll be a great deal more fun than sitting on the sidelines by myself.